With a marathon’s worth of tunnels under one of the most densely populated and complex cities in Europe, the sheer scale of London’s new railway line is overwhelmingly impressive. The £15bn Crossrail project needs to accommodate 200 million passengers a year across a total of 100km of track with 40 stations (including 10 new ones). Work began back in 2008 and most of the tunnelling is now complete — but services won’t start running until 2018 so there’s still plenty to do. 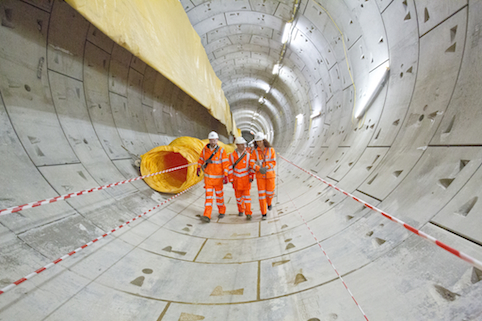 For the latest in our series of reader Q&As, members of the engineering team behind Crossrail have answered your questions on the difficulties and innovation of the project. Which were the trickiest parts of London to tunnel underneath and why? Crossrail is among the most ambitious infrastructure projects undertaken in the UK and will dramatically change how people travel across London. the machines have completed their drives. The project teams specified and procured machines and equipment appropriate for the anticipated ground and groundwater conditions, and have employed construction methods suited to the ground and equipment chosen. As a result the general tunnelling has been completed as planned and as expected. to sensitive structures and services on several contracts. For both TBM and SCL tunnels, controlling ground movements where protection of third-party assets was reliant on controlled settlement as the main method of protection This has been further complicated where multiple contracts have affected the same asset, where tunnels have been constructed in close proximity to each other and when tunnelling at shallow depth, close to third-party assets. Regional dewatering of the deep aquifer to assist in the construction of some of the cross-passages and deep shafts. On the Thames tunnel section (Plumstead to North Woolwich), the TBM drives and SCL cross-passages had to cope with high water pressures, including a tidal variation of 8m in very permeable strata. Why was it necessary for Crossrail to pass so close to existing Tube lines? Couldn’t it have ‘dived’ underneath them? Mike Black, Crossrail head of geotechnics: Crossrail was designed to provide direct connections to London Underground and National Rail. Constructing Crossrail with deeper tunnels and stations would have required an increased number of escalators and passageways to enable passengers to not only access Crossrail services but also interchange with the existing transport network. Not only would this have cost implications but deeper tunnels and stations would increase the time it took for passengers to access and exit Crossrail platforms. Additionally, in the event of an emergency, deeper stations would result in longer evacuation times. A further potential issue resulting from deeper tunnels would be a wider zone of surface settlement. While the magnitude of the vertical movement within this zone would be less than for shallow tunnels, potentially more buildings and utilities would be affected. The Crossrail stations are situated as high points relative to the running tunnels to allow for more energy-efficient braking and acceleration of the trains when entering and leaving stations. The current methods of station construction would become very inefficient if the tunnels were deeper. The current configuration of open boxes at either end of the tunnelled stations would become impractical and stations would most likely be limited to tunnel-only access to the platform levels. The ground loads and consideration of long-term design loading for groundwater would also result in significantly more robust structures and foundations. What was the technical process used in ‘threading the eye of the needle’ — tunnelling between the very tight clearances between the escalators and the Northern line at Tottenham Court Road? Andy Alder, Crossrail project manager, western tunnels: Crossrail used an earth pressure balance (EPB) tunnel-boring machine (TBM) to mine the western-running tunnels between Royal Oak and Farringdon. The EPB TBM mined the section of tunnel directly above the operational Northern line platform tunnels at Tottenham Court Road, directly below the London Underground station structures, with less than 800mm clearance to each. The EPB TBM controls ground movement during the tunnel mining by maintaining pressure on the clay being excavated within the cutting face. 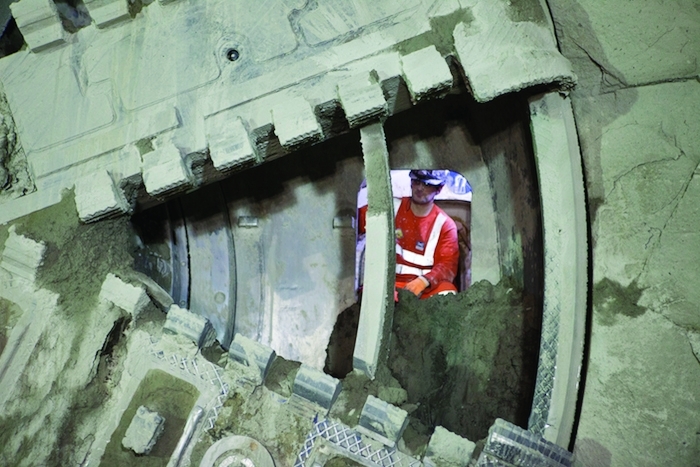 The cutterhead rotates as the TBM advances, cutting the clay with tungsten carbide cutting tools. There is a steel bulkhead that creates the cutterhead chamber, separating the cutting face from the inside of the TBM. A screw conveyor removes the excavated clay from the cutterhead chamber, and the speed of rotation of the screw conveyor controls the clay pressure at the cutterhead. In this way the ground movement is controlled and minimised. Foam is mixed with the clay to create the right consistency of spoil to use the screw conveyor to maintain pressure. Pressure in the TBM is monitored in real time to allow it to be controlled. Behind the TBM, precast concrete segments are erected to create the tunnel lining. Cement grout is injected around the segments under pressure to lock the segments in the ground, and to ensure that all voids are filled. A laser guidance system is used on the TBM, to ensure that its position is accurately known. Variable pressure on the TBM shove rams around the circumference of the TBM is used to control the TBM position to within ±50mm. Automatic monitoring was undertaken in the Northern line platform tunnels. This used an automatic theodolite to record the position of a number of prisms fixed to the existing tunnel lining and record any movement. This data was analysed in real time to monitor the effect of the mining on London Underground’s assets. Recorded movements were less than 3mm, well within predictions, and a remarkable feat given that the 1,000t TBM passed only 800mm above. Crossrail is routinely described as ‘Europe’s biggest archaeology project’ as well as Europe’s biggest construction project. To what degree have archaeological concerns hindered the progress of the project and how have you dealt with them? Jay Carver, Crossrail lead archaeologist: Archaeological finds have tremendous potential to affect a construction schedule. Unexpected finds are the key risk alongside access problems and logistics that in urban environments often prevent an early start on the archaeology works. To address this, we started at detailed design with a very thorough research phase to understand the historic land use at each of the 40 or so work sites. That allowed us to assess what the actual quality of archaeological remains was likely to be, and grade the programme risk — for example, the impact that archaeology delays could have on subsequent works. Combining those issues allowed us to assign each site a critical, high, medium or low rating. Critical programme sites included, for example, Liverpool Street ticket hall, where the quality of the predicted archaeology (a deep sequence of Roman remains and a 16th century burial ground) indicated that early site access was essential even though it would not be easy. In that case, a road closure and excavations to a depth of 6m was needed to fully quantify the risk. Although we have had the occasional last-minute find, such as the large haul of ice-age finds, right at the place where the western tunnels were to start at Royal Oak Portal, a daily working relationship with colleagues in construction management has meant that solutions have been found. This includes acceleration of the work with increased resources and extended hours and carefully agreed work stages to allow both construction and archaeology to continue concurrently. Will there be any significant differences between the engineering techniques used on Crossrail and Crossrail 2, if it happens? Chris Dulake, Crossrail chief engineer: It is envisaged that the design and construction techniques for implementing Crossrail 2 main infrastructure will be very similar to that deployed for Crossrail. 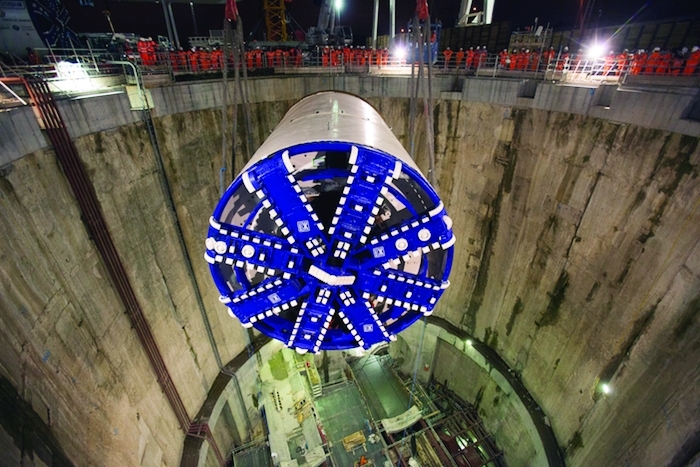 Crossrail 2 has a deeper alignment in parts through the central area and will therefore present slightly different challenges in terms of structural loading, and constructing structures at depth. Potentially different predicted ridership and passenger demands on Crossrail 2 may also determine changes in station geometry and train lengths. However, design and construction techniques are not expected to be significantly different. Following on from experience gained on Crossrail and potential technological advances in the next few years, it is possible that some of the ground movement monitoring techniques and approaches will be different for Crossrail 2, taking more advantage of fibre-optical systems, satellite GPS technology and automated systems using analytical techniques on real-time ground movement data. What was the biggest engineering challenge that you have encountered since starting the project and what steps have you taken to overcome this? Bill Tucker, Crossrail central section delivery director: The biggest engineering challenge on Crossrail, in my opinion, is management of interfaces. The original design, which carried the programme through the Crossrail Act, was the product of three multi-discipline consultants (MDCs). Framework design consultants (FDCs) were then engaged back in 2009 to progress the design of the bored tunnels, SCL tunnels, stations, portals and shafts to the point that we could tender for construction contracts. Now, we have our civil contractors performing temporary works design and detailed design for mechanical, electrical and architectural/fit-out of our stations, portals and shafts using standard specifications developed by our FDCs. Other FDCs also developed the conceptual design of our rail systems (track, traction power, HV power, signalling and communications) that our rail systems design-build contractors are now taking through detailed design. In total, approximately 30 design consultant companies have been engaged in some aspect of the Crossrail design for either ourselves or our contractors. 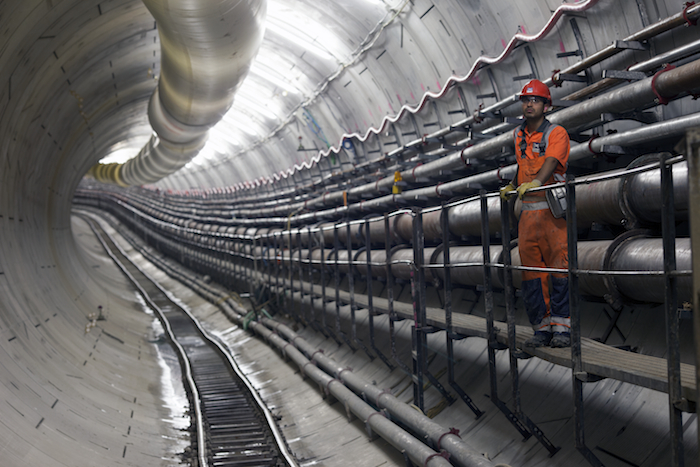 The Crossrail Technical Assurance Plan (TAP) outlines how we manage and accept designs from both our FDCs and contractors. The TAP specifies a gated acceptance process, which incorporates single-discipline and inter-discipline reviews and gains the concurrence of our infrastructure maintainers, London Underground and Rail for London. Achieving the acceptance gates for our contractors’ detailed design is important to maintaining our critical path programme. Managing the contractors’ design in a manner that considers the complexity of these interfaces is a top priority of our project teams and chief engineer’s group every day. What would the Crossrail team do differently in the processes they adopted to manage the design and other activities of their project that was done before they started construction knowing what they do now as they come to the end of their programme? Patrick ten Have, Crossrail chief engineer’s group: There are many opportunities to do things differently; the question is always what would have made a difference? Perhaps one area we would adopt for future programmes like Crossrail would be to better understand the linkages, constraints and interfaces between the design of the underground structures and the actual construction methodology and timing thereof. This would involve completing the design to a greater level of detail prior to the award of the construction contracts so as to avoid change and the knock-on effect on other disciplines. Another consideration would be reducing the overall number of interfaces between contracts by grouping the asset base into larger packages of work and aligning the designers in the same fashion. Have you been working with HS2 or any of the other rail infrastructure improvement projects going on, and how? What advice would you have for these teams? Chris Sexton, Crossrail technical director: Crossrail has regular liaison with HS2, Thames Tideway Tunnel and Thameslink, and works very closely with Network Rail and London Underground as delivery partners for Crossrail. It is always a challenge to offer relevant advice to another project which is invariably facing similar but slightly different challenges. Apart from the number one priority of safety, I would offer three areas of focus: design accountability; management of interfaces and integration; and stakeholder engagement. For design, ensure that accountabilities are clearly understood, BIM is fully adopted by all designers from the start and sufficient time is allowed for a mature design to be issued for construction. On a large programme the packaging and sequence of design contracts contributes to the complexity of the challenge and due weight needs to be given to how the design will be assured and how the works are intended to be handed over. Accountability for integration and managing interfaces also need to be clear — not just on paper but actively managed and rigorously and regularly checked. Time spent on engaging stakeholders is never wasted; respect people who are affected by the works by minimising the impacts of construction and being as good as you can be in keeping promises and communicating what is happening in good time. 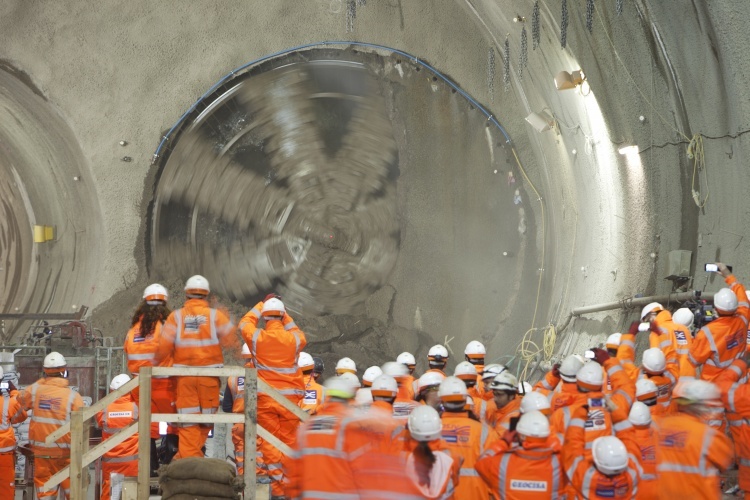 How well have the Crossrail tunnelling academies helped fill your recruitment needs? What will all those tunnellers do with their skills once the project is over? Valerie Todd, Crossrail talent and resources director: From the outset we identified that there was a shortage of talent in the labour market. We wanted to do something to re-energise the skills base within tunnelling and underground construction particularly, but in rail engineering and infrastructure generally. 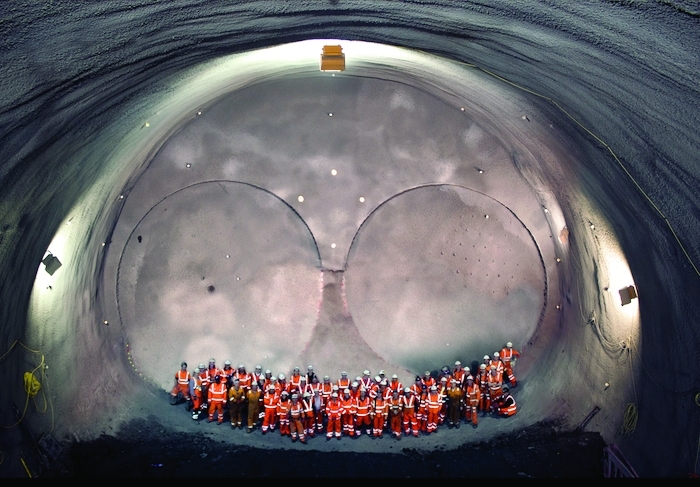 The Tunnelling and Underground Construction Academy (TUCA) established by Crossrail in 2011 has been a huge success. This has supported employers looking for workers by providing pre-employment training, tunnel safety training, apprenticeships and advice and guidance to those seeking work. Approximately 7,000 people have received some form of training at TUCA, which has enhanced their employability by equipping them with skills and experience valued by employers. New apprenticeships developed by Crossrail specifically for the project include tunnel operations, gantry crane operations, locomotive operations and spray concrete lining; while existing apprenticeships on offer include business administration, procurement, document administration, finance, HR, IT and accounting. Apprentices receive both training in a college environment and hands-on application in the workplace, and are employed by Crossrail itself, or one of the programme’s numerous partners and contractors. 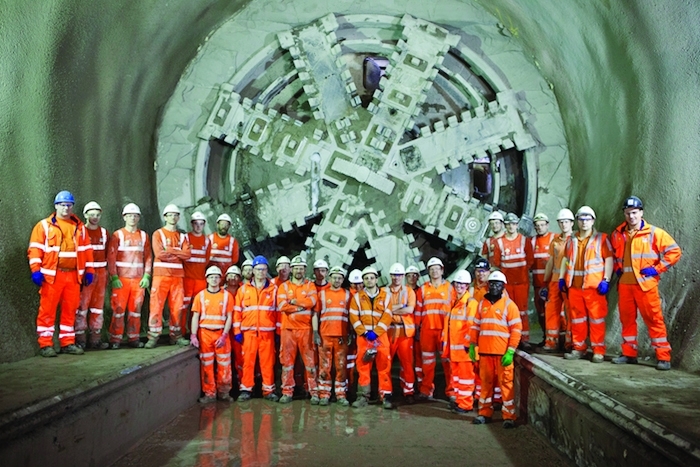 Nearly 400 apprentices have worked on Crossrail to date. Following Crossrail there will be Thames Tideway, the Northern line extension, HS2 and Crossrail 2, which will all require tunnelling expertise, as will the next generation of nuclear power stations. Once again, a demonstration of stunning technology and the related integration and administration, timing, and design skills which will ensure success. And almost all out-of-sight -albeit clearly not out of mind! I was particularly impressed with the comments about the amount of pre-training and skill-development offered to folk who otherwise would have nothing to offer a future employer. Whatever the cost £15 billion (and let’s be honest, these probably did ‘over-run’ a bit….) it is money well spent. The capitol city- and its ability to conduct its affairs more effectively- are enhanced. The similarity between the skills shown here and ‘the Big Dig’ in Boston, Mass, USA some years ago surely does demonstrate that all Engineers, whatever our field of work, should be proud of what what can be achieved by our fellow practitioners. Sadly, though perhaps symbolic that the ending of our Nation’s participation in warlike activities in Afghanistan (after 13 years) is announced on the same day. Almost three times the cost, some 450 lives lost (what do I mean by lost, they were taken!) ten-times as many injured and/or disabled….who will suffer mental distress for the rest of their lives and be a cost to the State (in awards, pensions, etc) for 50+ years: the result? A backward country has taken a small step upwards, but the likelihood of it slipping back to medieval horror and anarchy…even on the assessment of our military…strong! What was the excavation cost per cubic metre for a 7 metre diameter tunnel ? What is the maximum rate of excavation ( metre per day ) ? 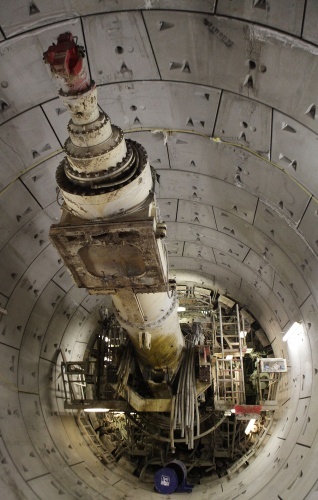 What is the purpose of keystones in the Crossrail tunnel lining?